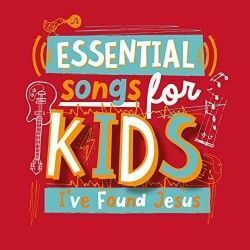 Essential Songs For Kids is an exciting series presenting lively, singable and faith-rich songs of praise for kids written by a variety of top children's songwriters. "I've Found Jesus" is number 3 in this popular series and is once again perfect for all-age meetings, children's clubs, families and worship leaders. These 12 songs are a great resource as well as providing Bible truths and stories to energise and develop faith in young lives. Songs include favourites "Big Family Of God", "God's Love Is Bigger Than A Burger", "Be Strong and Courageous" and the joy-filled classic "I've Found Jesus". Continuing the series of Essential Songs for Kids collection of albums from resource publisher Essential Christian is this compilation called "I've Found Jesus". It's another collection of songs that can be used in children's activities and worship taken from a range of different artists and styles, some of the artists are well known as providers of resources for children's ministry and others are a bit more surprising. As with other discs in this series, many of these tracks are not performed by the original artists. The album opens with a series of songs from people that you might not expect to find on a kids CD. This begins with Lincoln Brewster's "Love The Lord Your God" which works surprisingly well as a kids song. It's fairly simple but conveys a key Biblical principle and response. This is followed up by a version of the Hillsong Young & Free track, "Alive" and then a version of the early Delirious? song "I've Found Jesus". These tracks themselves probably don't need any introduction or explanation because they are quite well known. We are back in more familiar territory next with Becky Drake's "All Through History" which is a good run through some well-known Old Testament Bible Characters and finishes on Jesus sacrifice for us. On this album, along with the later "I Turn To Your Word", this track is performed by the "New Irish Kids" who are an amazing children's choir, unsurprisingly from Ireland, who released an album called "My Lighthouse" back in 2015. Then it's a distinctive short chorus which was originally from the legend of Christian Children's resources, Ishmael, with "Father You Made Us". As a quick aside, this does seem like an odd track as it was also included on "God's Game Changers" one of the previous titles in this series. The next track is "For The Pleasure Of The King" from Trevor Ranger and Becky Frith, and this track is very much a worship song for kids, but it is a cross-over track that could be used in adult worship as well. Sticking with people well known for their contribution to children's songs the next track is Doug Horley's "God's Love Is Bigger Than A Burger". This track is quite a typical Duggie Dug Dug song with a lot of questions about what God's love is bigger than and I am sure that you can have a lot of fun with this song. There is a version of "Be Strong And Courageous" on this album which is a promise taken directly from Deut 31 v 8. "The Wiggly Waggly Song" probably doesn't have quite so much scriptural value, but again it is a fun song and reminds us that there is a diverse world and we are a special part of God's creation. "Big Family Of God" from Nick and Becky Drake also carries the message that we are all special because, even though we are all different, we are all loved by God just the same. The last track on the album seems a bit out of place, but it is "Sing With The Angels" from Stuart Barbour which as you may have gathered from the title is a Christmas song. I think of the albums in this series that I have reviewed so far this is probably my favourite for a blend of all-out kids fun songs and usable age-appropriate worship songs. There's a lot to like on this album, but ultimately it is a resource and not something you would necessarily play in the car on a family trip.